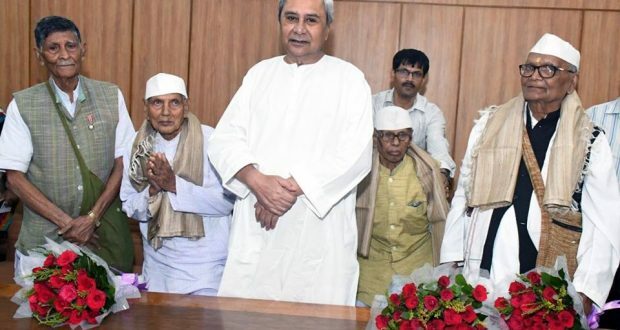 Bhubaneswar:7/8/18: Chief Minister Naveen Patnaik on Monday felicitated three freedom fighters of the state, who have received invitations to attend the ‘At Home’ function to be hosted by President Ram Nath Kovind at Rashtrapati Bhawan in New Delhi. The freedom fighters are Ramhari Goswami of Bhadrak, Ishwar Bisoi of Nayagarh and Debendra Gupta of Sambalpur district. The CM presented shawls and bouquets to the freedom fighters at a special programme organised at the Secretariat. The President of India will host the ‘At Home’ for freedom fighters on August 9 (Kranti Divas) to mark the 76th anniversary of the Quit India Movement. On the occasion, the President will honour and felicitate freedom fighters from across the country. Previous: Nationwide strike called by the Transport Workers’ Federation tomorrow.